A new case of Fusarium oxysporum (Fo) causing significant economic losses in pepper (Capsicum annuum) crops in Culiacan, Mexico was recently reported. To fight this newly discovered disease, it was necessary to analyze the host specificity to use this information in an integrated disease management. To achieve that, the host range of 10 strains of Fo collected from diseased pepper plants was checked on the following species: Capsicum annuum, Solanum lycopersicum, Nicotiana tabacum, Nicotiana bethamiana, Solanum melongenea, Phisalis ixocarpa, Cucurbita pepo, Cucumis sativus, Cucumis melo. These 10 strains were also tested on four differential tomato cultivars for Fo f. sp. lycopersici (Fol) races identification. Both assays were repeated twice under growth-chamber conditions. All 10 strains of Fo caused wilting symptoms on each of the species mentioned above, indicating that these strains have a wide host range. During race characterization assays, the typical phenotypic responses displayed by the four differentials ‘Bony Best’, ‘Manapal’, ‘Walter’ and ‘I3R3’ against these 10 strains, suggested that all these strains belong to Fol race 2 (Fol-2). These strains were tested by using PCR technique to detect the SIX genes specific for Fol races and the results indicated also that these strains belong to Fol-2. However, further molecular and vegetative compatibility group studies with these strains most be carry out to corroborate these results. To our knowledge, this is the first cross pathogenicity report of Fo in Solanaceae and Cucurbitaceae crops in Mexico. The online version of this article ( https://doi.org/10.1007/s10658-019-01732-z) contains supplementary material, which is available to authorized users. No part of the manuscript has been previously published or is in consideration for publication in another journal. The authors declare that they have no conflict of interest. All authors are in complete agreement for the submission of the manuscript. Biju, V. C., Fokkens, L., Houterman, P. M., Rep, M., & Cornelissen, B. J. C. (2017). Multiple evolutionary trajectories have led to the emergence of races in Fusarium oxysporum f. Sp. lycopersici. Applied and Environmental Microbiology, 83. https://doi.org/10.1128/AEM.02548-16. Boix-Ruíz, A., Gálvez-Patón, L., de Cara-García, M., Palmero-Llamas, D., Camacho-Ferre, F., & Tello-Marquina, J. C. (2014). 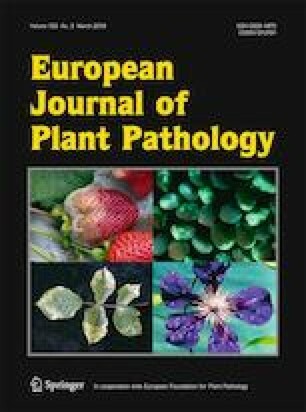 Comparison of analytical techniques used to identify tomato-pathogenic strains of Fusarium oxysporum. Phytoparasitica, 43, 471–483. https://doi.org/10.1007/s12600-014-0444-z. McGovern, R. J. (2015). Management of tomato diseases caused by Fusarium oxysporum. Crop Protection. https://doi.org/10.1016/j.cropro.2015.02.021.